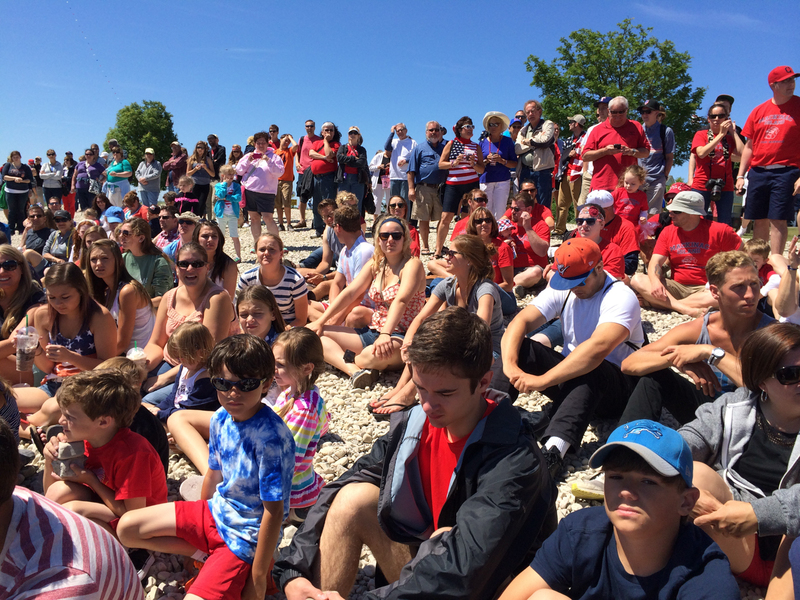 Every 4th of July people gather on the south side of Mackinac Island at Windermere Point for the annual Mackinac Island Stone Skipping Tournament. A few hundred people assemble, building up the noon tournament of stone skipping professionals. For the amateur division, anyone can enter for just $5, with proceeds going to the Mackinac Island Hospice. Each contestant can pick a selection of six stones from the beach or opt to bring their own, as the professionals do. This is still a high-debated practice among the purists, as covered in the Wall Street Journal. With stones in hand, the contestant finds a judge who carefully counts the number of skips and records it on the scoresheet. The judges are highly trained professionals, many have been coming to the Mackinac Island tournament for a decade or longer. All you need is one good throw, your highest skip-count is recorded and the rest are thrown out. The person with the highest number of skips. The amateur division leads up to the professionals, this is where things get really exciting. Beforehand, professionals can be seen warming up and signing stones for fans. The format for professionals remains the same, except they alternate taking turns and have somewhat of a loose “shot clock”. Each of the professionals bring their own unique image to the tournament. There’s the token young athlete, the businessman, the local Islander, the hippy, the veteran, the rookie, and more. Each has their own nickname as well: Mike “Airtight Alibi” Williamson, John “Skippy” Kolar, Max “Top Gun” Steiner, Glen “Hard Luck” Loy, and the famous Russ “Rock-Bottom” Byars, who is the current world-record holder and even has a trading card from Topps. I can often be found on the west side of Presque Isle in Marquette training while watching the sunset and have loved stone skipping for as long as I can remember. You’re welcome to join me at anytime. In 2008, one of our first ever blog entries was 13 Tips to Becoming a Better Stone Skipper. Shortly after publishing the blog post, “Rock-Bottom” Byars commented and even gave some compliments. I was elated. It was about this time we learned about the tournament on Mackinac Island. It has been a dream for years to participate in the contest, and finally in 2013 it came true. I was fortunate to introduce myself to Russ Byars before the tournament. It was time to participate, and I found what I could on the beach for stones. The conditions were about an 8⁄10, and it doesn’t get much better than that on Mackinac Island. For my handle I chose “BugsyRocker”, which was my screename on AIM since I was about 13 years old, and www.bugsyrocker.com was my first ever website. It was a perfect for fit for a stone skipping nickname. After my first two skips my nerves settled. I finished with a high of 15 skips. It was decent, but I wasn’t satisfied and knew I could do better. The winner of the amateur bracket was a 16-year old with 22 skips. Now that I knew where the bar was set and had one stone skipping contest under my belt. One week later I recorded one of the best skips of my life in Assinins, without a doubt it was in the high 20s. @UpperPeninsula glad to see your trying!!! Now bring your A game July 4th. Now that I got called out publicly on Twitter, I had to show up and defend my skills. A whirlwind road trip commenced and I was on my way to Mackinac Island for a second year. Conditions were a little worse this year. Finding stones on the beach were slim and while practicing I just wasn’t performing well. With six stones in hand I stepped up and found may same judge from the previous year. My throws weren’t great. I was hardly hitting double digits and knew I needed to do better if I wanted to win. Thankfully, all you need is one good throw. Just one hole-in-one, if you will. My 4th throw was 21 skips with a number of pitty-pats at the end. I could breathe a little easier, especially knowing last year’s amateur winner was 22 skips. I’ll admit, I got a little lucky with that one throw. Patiently and nervously, I waited for an hour as they announced the high skips of more and more participants. I nervously watched others as they threw some quality skips. In the end there were several people tied for second, with 17 skips. 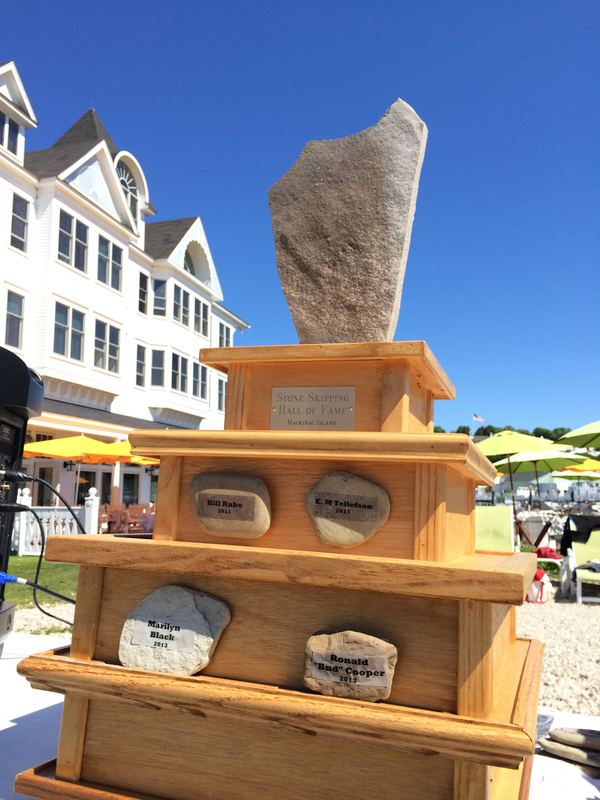 In just my second appearance I had won the 2014 Mackinac Island Stone Skipping tournament (amateur division). I’m happy to say I won with stones collected on site. With the Little David Trophy in hand, I was given the option to take 5 pounds of fudge or accept an invitation to compete in the professional open. The crowd was cheering for me to take the fudge, and it was tempting. But I’m competitive and wanted to see how I could stack up against the professionals. There were 12 of us competing. I was 3rd in line, following my idol Russ “Rock-Bottom” Byars. The pressure was on. And unlike the amateur competition, the pros bring out a big crowd, people are cheering, ooh-ing and ahh-ing with each throw and skip. In the end, the conditions weren’t great. Several of the pros had skips in the single digits as we battled the waves. My high during the pro competition was 17 skips. The winner was Mike “Airtight Alibi” Williamson with a total of 26 skips. To compete with the pros was an honor and I achieved the goal I had come back for. With some more training and a little luck, maybe I can get an invite to compete with the pros in the future. Otherwise, I’ll be looking to defend my amateur title. At Yooper Steez we consider him a legend, a hero, and one of the most iconic people of Michigan and the Upper Peninsula. His name is Bill Rabe (RAY-bee). Among founding the Mackinac Island Stone Skipping tournament, he also founded the LSSU Banished Words List, Unicorn Hunters, and Snowman Burning Day. His p.r. stunts have stood the test of time, we admire his creativity. Bill founded the contest in 1969 and was the director for the next 23 years until his passing. Bill was the first inductee for the Stone Skipping Hall of Fame. The trophy is a prized possession and few have been given the honor of being inducted. It is highly debated between the Stanley Cup as being the most sought after trophy in the world. We hope to see you there in 2015! We’re keeping our fingers crossed for an pro invitation, and if not we’ll just have to win the amateur division for a second year in a row. Mike Rows Says Nice Things About the Upper Peninsula, and You Should Too!